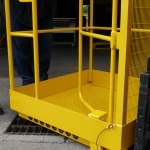 The Grab-O-Matic SC2-MK3 Gated Safety Work Platform is a fork attachment 2 man cage for safely lifting 1 or 2 persons with a fork truck to allow basic maintenance such changing light bulbs, cleaning lights or signs and all other occasional maintenance jobs. 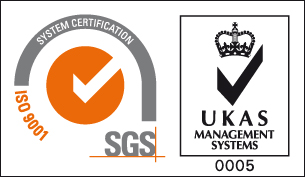 The SC2-MK3 can be quickly and easily attached to the forks of a fork truck and is secured by heel pins. 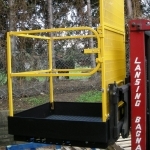 This unit has self closing gated access and can only be opened when the unit is on the ground. 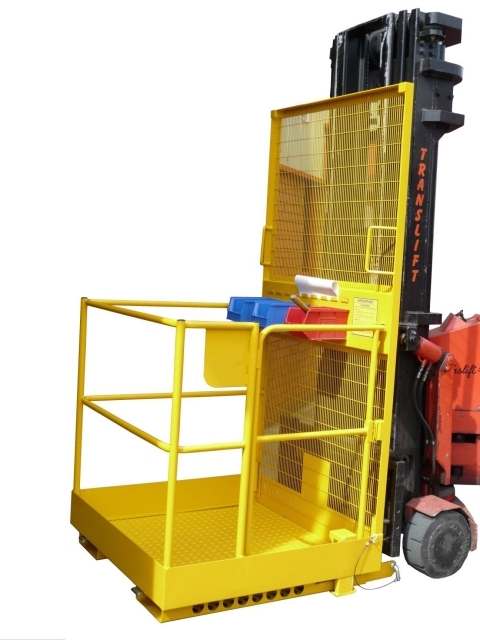 We have a range of models available which include the SC2-E Economy Safety Work Platform which has a climb through bar system and the SC2F Folding Safety Work Platform which folds neatly inside itself to allow easy storage under a rack or bench. 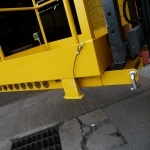 Heel pins secure the platform to the fork truck. The platforms can be used for general high level maintenance. The MK3 gate will only open when the unit is resting on the floor. If space is at a premium the SC2-F folds into a neat package for storage.